The 29th anniversary of the Hillsborough Disaster was marked not by the usual minute of silence before the closest home game to April 15, but instead by a minute of applause at Anfield prior to Saturday’s game against Bournemouth. It was a strange experience in many ways. Brought in from the continent, and often used in this country as a way of drowning out any heckling from opposing fans for polarizing figures or events, the minute of applause isn’t a universally embraced phenomenon in this country. 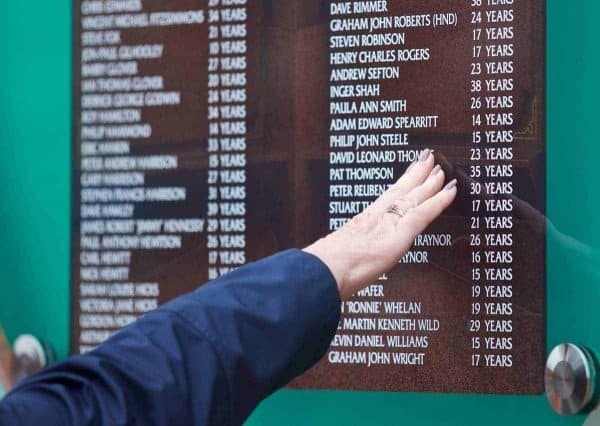 A conscious decision on behalf of the families of the 96 victims, however, it marked an invisible line in the sand of sorts. Instead of contemplating the painful loss of those who never made it home from the 1989 FA Cup semi-final, it was a gesture in celebration of their lives. It was maybe a sign that there is a degree of peace to be found for those who lost their loved ones at Hillsborough. Or at least a first step in that direction. There will never be a cure for the pain, but a post-bereavement peace that most people eventually locate when they lose a loved one might be possible. 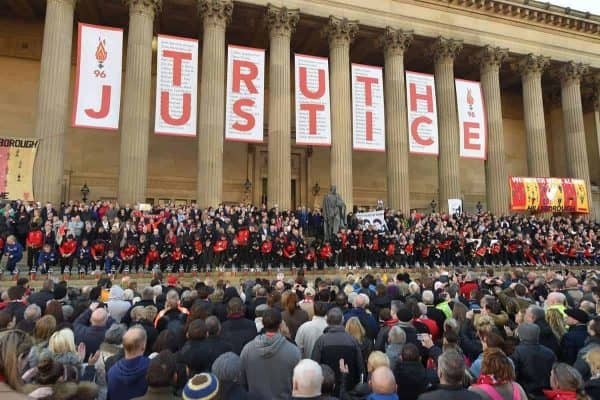 Among the many things of which were stolen from the families of the victims of the Hillsborough Disaster by South Yorkshire Police, and countless other institutions of both power and public trust, post-bereavement peace will have been a particular torment. A torment which took too many good people to an early grave of their own. The death toll of the Hillsborough Disaster eclipses the 96 in broader terms. Stephen Whittle for example, who took his own life in 2011. Unable to any longer take the post-traumatic stress of having sold his ticket on to a friend, when work commitments stopped him going to the game. Stephen’s unnamed friend subsequently died on the Leppings Lane terrace. There is no end to the fight for justice and the pursuit of those who continually attempt to evade it. 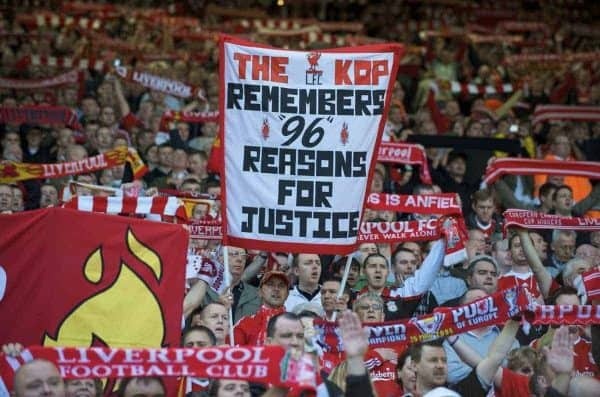 The battle goes on, yet the celebration of those who were lost at Hillsborough has often been shrouded behind the number 96 and the campaign in general. I was just a few weeks short of my 15th birthday on April 15, 1989. The names of the victims which were around my age then have always stayed with me. By the narrow margins of chance, it could have instead been the names of any of us who were clicking through those turnstiles back then. Like me, Adam Spearritt was 14 too. He went to Liverpool games with his dad, in the same way I did. Kevin Williams, son of the inspirational campaigner Anne, was 15. He died alongside his friend Stuart Thompson, who travelled to the game by train with two other friends who managed to make it home. Kevin Tyrell also 15. He went to Sheffield with friends by coach from Runcorn. His friends lost sight of him as the game kicked off. Lee Nicol, another aged 14. A friend saw him knocked to the ground by the force of the crowd. Paul Murray 14, who travelled from Stoke-On-Trent with his father. Both were knocked to the floor and his dad never saw him alive again. Peter Harrison 15, who went to the game with friends. With tickets in different parts of the ground, it was Peter who went on to Leppings Lane. Phillip Hammond 14, another who travelled with friends, only for them to helplessly see him swept away. Philip Steele 15, there with his parents and his brother. A broken family returned home without him. Thomas Howard 14, who died alongside his father, also named Thomas. Victoria Hicks 14, who heartbreakingly died with her 19-year old sister Sarah. Daughters of Trevor and Jenni, two of the driving forces behind the campaign for justice. And then there was Jon-Paul Gilhooley who was just 10, the cousin of Steven Gerrard, who went to the game with two of his uncles. The youngest victim of the Hillsborough Disaster and the same age as my own son, who I now take to watch Liverpool play. All 96 victims were robbed of a future, but rightly or wrongly, it has always been those that were around my age that stayed with me the most. They were just children. Some of them more streetwise than others, yet they missed out on all the passages-of-rites that I rolled through as I reached onward to my late teens and into my 20s, while their loved ones missed out on the chance to cheer them on from the sidelines as they ticked each lifetime landmark off the list. Those loved ones also missed out on the chance to mourn them in a more healing manner. Maybe they have the opportunity to do that now.